Dr. Grete Hovelsrud of the Center for International Climate and Environmental Research - Oslo (CICERO) Institute recently talked to SciencePoles regarding the role social sciences are playing in the International Polar Year 2007-08. Dr. Hovelsrud is a member of both the International Polar Year 2007-08 Joint Committee and the Norwegian National Committee for the International Polar Year 2007-08. How did there come to be social science research projects in the current International Polar Year 2007-08, given that none of the three previous International Polar Years had any? Social Sciences were actually not included in the beginning when the current International Polar Year was being planned. The social science community decided to make some noise about this, and we came up with some ideas and themes. In 2003, when the first draft of the themes for the IPY was presented, it had five themes, none of which were related to the social sciences. Then the International Arctic Social Science Association (IASSA) started to pull together its members, arguing that the Arctic has a lot of people living there and we need the presence of social science in the Polar Year programme. It was essentially the community of polar researchers who are also social scientists who eventually got a sixth theme of people included in the IPY. Are the natural sciences integrating enough indigenous and local knowledge into the IPY research projects in your opionion? We are encouraging projects to be aware of indigenous and local knowledge, and when possible, to integrate that knowledge into their research. The process of integration is not an easy process. If it can be done, we think that's great. We are happy that many of the projects where indigenous and local knowledge is relevant to the natural science research project, the researchers are at the very least sensitive to this knowledge. How are the social sciences integrated into the Developing Arctic Modeling and Observing Capabilities for Long-term Environmental Studies (DAMOCLES) project that CICERO is participating in? There are two parts to the social science part of DAMOCLES. The first part is concerned with the impact of climate change on communities in the Arctic. We are picking a few communities to look at in depth. We're trying to paint a picture of what the impact of climate change will be on these communities. The next step is to work with the same communities that are dependant on the ocean for their livelihoods, whether it be fishing and shipping or the oil and gas industries in the area, to see what kind of climate or extreme weather events they are sensitive to. Many people in these communities are asking for information on Polar Lows, which is a weather phenomenon particular to the Polar Regions. The information we get from the local people living there will be relayed back to those in DAMOCLES who are making satellite observations of the climate, so that the observations can be adjusted to the specific needs of the users. This is important because there is always the possibility that observations are being made and models are being developed that aren't relevant to the people who are living in the places where they're making these observations. To make better forecasts in the future, we think observations need to be tied to the needs of the local people such as the fisherman for example. We are also using the models created by those in DAMOCLES who are responsible for modelling the sea surface temperature, air temperature, and precipitation in the region so that we can see what conditions to expect in these Arctic communities. I think it's really great that in the end we will end up with the local people on the ground and in the boats being involved in feeding information to the observational system of the natural sciences. This means that a connection will be made in a very unique fashion, and you'll also have something practical for local people. How does IPY research approach climate change and how it affects Arctic communities? One must look at climate change as one of several stressors affecting Arctic communities. Climate change stresses the natural environment, which in turn stresses human societies, and social situations within those societies. The evidence of climate change is all around. The ice is retreating much faster and is behaving differently from what we originally thought. I would expect the impact of climate change to be greater on some communities as opposed to others, depending on sea and sea ice conditions as well as the marine mammals that are particularly sensitive to climate change. Climate change may also have a direct impact on transportation and infrastructure, as melting permafrost in particular is leading to soil erosion, which in turn damages roads and buildings. It's the complicated coupling between humans and the environment that we are after in some of these projects. This is not easy to look at. The work that is currently being done looks at a multiple stressor situations for the local people. What kinds of methodologies do you use when researching adaptation strategies used by Arctic communities? In the Community Adaptation and Vulnerability in the Arctic Regions (CAVIAR) project, which is a major IPY cluster CICERO is involved with and which I am leading together with Dr. Barry Smit from the Department of Geography at the University of Guelph in Canada, we use stakeholder interviews - some of them structured, some semi-structured. The CAVIAR project takes a bottom-up approach. We look at what kind of climate elements stakeholders in the communities we are studying would be sensitive to. These climate elements are then downscaled, and we discuss these results with the local stakeholders. After this we try to link this information with the condition of living resources so that we learn something about the fisheries, for example. If the ocean gets warmer and the cod move offshore or to different places, this would impact communities dependent on fishing as a source of food. We also look at other socio-economic factors like demographics and do an economic analysis of the sectors. It's a mixture of several things. We look at grey literature describing how things were and what kind of strategies have been used in the past and see if we can glean something from that grey literature. We look at archives of data, especially demographic, economic and social statistics that could be combined to get a good picture of the community. Once we have some kind of baseline information, we use this to project the future climate situation. We then determine if the climate will change sufficiently to affect the resource base, ad look at how this will impact the local community and what would be their adaptive capacity in terms of the socio-economic responses that one would expect. How do institutional limitations affect adaptation measures for indigenous peoples? When you look at the various government and other social institutions that surround indigenous people in particular, they can create limitations to their adaptive capacity. 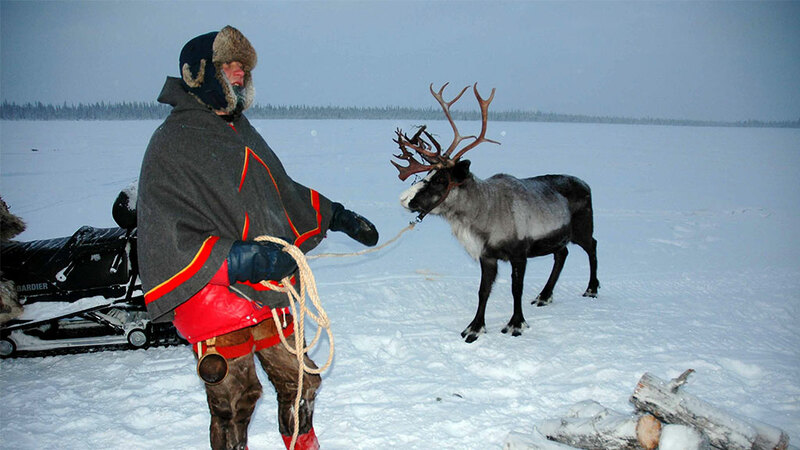 For example, with the reindeer herders, there are regulations stipulating the amount of reindeer you can have and controlling access to feeding grounds. There may also be encroachments on their feeding grounds such as the building of fences or roads. When you look at all of the various factors affecting people living in the Arctic and you throw in climate change, the whole picture becomes a lot more complex. Dr. Grete Hovelsrud is a social anthropologist at the Center for International Climate and environmental Research (CICERO) in Oslo. Her research interests include interdisciplinary studies on impact, adaptation and vulnerability to climate change, development of multidisciplinary theoretical and methodological frameworks for analyzing multiple factors of coupled human-environment systems (particularly in the Arctic), interdisciplinary studies of the impact of climate change, general arctic anthropology, and local knowledge in research.